I took advantage of her generous spirit to ask her questions because of her expertise in so many writing genres. Speaking of generosity, the mother of six donates 10 percent of her royalties from the Lantern Hill Farm series, [The Christmas Cradle is one], to Compassion International. All of the royalties from Redeeming Ruth support orphans and children with disabilities in Uganda. More about Merrill at the end of–and throughout–the Q & A. Do you think of different ideas for children’s vs. adult books? Ironically, I began experimenting with ideas for children’s books long before I sat down to write a book for adults. Writing for children seemed more accessible—not because it is easier but because I strongly connect with my childhood. However, while taking workshops and attending conferences to develop my skills as a writer, my family adopted Ruth, an abandoned baby from Uganda who had multiple disabilities. So many people began asking about Ruth, I started writing her story, which turned into my memoir, Redeeming Ruth. A few months after it was published, I received a contract for a five-part children’s picture book series, Lantern Hill Farm. So you never know where you’re writing journey will take you. Is your inspiration from a different place? I’m inspired by events and images and words that touch me deeply—whether something that makes me laugh or cry or makes me question why the world is the way it is and how to make it better. I began writing Ruth’s book as a happily-ever-after adoption story, but when Ruth unexpectedly died from health complications shortly before her eighth birthday, it became both a spiritual lament and a treatise on the power of faith and love. 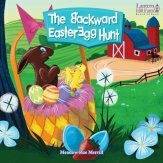 Many ideas for books come from my life and family, like The Backward Easter Egg Hunt, the first book I wrote for the Lantern Hill Farm series. A friend had asked me to organize an Easter egg hunt for a party. She had a basket full of plastic eggs, but I’d neglected to buy the candy. On the way to the party with my kids, I scratched down some ideas for a scavenger hunt based on the Easter story and gave the kids empty eggs to fill. They liked it so much, I turned it into a book, and my agent suggested a series. Walah! Lantern Hill Farm was born. Each story is designed around an activity to help children share God’s love with their family and friends around holidays. How complex can you make subject matter for kids? For the youngest readers, a picture book typically needs to focus on a single issue or problem. But that issue or problem can come from a complex experience. The challenge is writing about that experience in a way that is truthful and compelling but with a very limited number of words. My Lantern Hill Farm books are available in a longer version for older readers and as board books for the youngest readers. Reducing the text of each story from 800 words to about 150 was a real challenge, but I was surprised how many words I could eliminate and still have a complete story. I tend to write a much longer first draft to find my way into each story. Then I reduce, reduce and reduce to make that story stronger. Are there techniques to simplify a basic story? Once you know where your story is going, take out everything that isn’t necessary to move the story forward. That goes for writing for children or adults. Since I don’t always know where my story is going, it takes me a lot of extra writing to get there. The more I discover of the story, the more I know what to get rid of. Because a book for young children is usually much shorter than one for adults, is it easier—and faster—to write? Faster, yes. But only because a picture book contains fewer words to place in order. I suppose that also makes it easier, but I wouldn’t call it easy. Publishing my first picture book came after two decades of reading picture books to my own children. Thankfully I have a houseful! During that time, I was also working on my memoir and a middle-grade novel. For me, writing is a slow journey of discovery. The greater the number of words, the longer that journey takes. While my picture books take less time to write, I’ve been thinking about them ever since having children. How did you choose your illustrator—or does the publisher select the illustrator? My publisher, RoseKidz, selected the illustrator for the Lantern Hill Farm series. 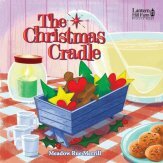 When the first book in the series, The Christmas Cradle, came out this fall, the characters were different from how I had pictured them, but I love how the artist, Drew Krevi, who has worked for Disney and Marvel Comics, captured the fun and excitement of the story. Do you think today’s children’s book authors have different challenges than those writing before the Internet, smartphones, electronic games and gizmos existed? I’m not sure if the authors have greater challenges or if the children do. Maybe it is a little of both. But certainly, technology has a way of disrupting attention spans of writers and readers alike. In my own home, I limit how much tech my kids (and I) have access to. For instance, we don’t have Wi-Fi. We run our Internet through a cord in the wall, so it is only available in a single spot. That opens up the rest of the house for reading—and we keep plenty of books. What were your favorite children’s picture books when you were a child? 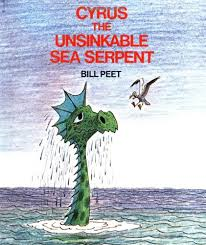 Cyrus the Unsinkable Sea Serpent, by Bill Peet, about a misunderstood sea monster, any and everything by Beatrix Potter and a children’s picture Bible that I carried around my childhood farm while my mother took care of her sheep and chickens. Regrettably, I had few picture books as a child and was rarely able to go to the library because my single mom was in college and had a farm to run. But the books I did have, I clung to like keys to a magical kingdom. They opened my mind to a world where things weren’t always what they seemed, where animals talked and life was ordered by something beyond what I could see. Perhaps because books were somewhat rare, I valued those I did have all the more. Do you have other questions to ask this prolific writer? What were your favorite books when you were young? 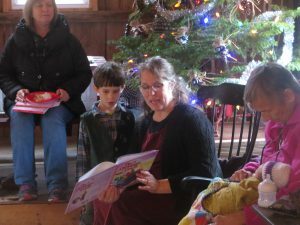 Photo taken at The Christmas Cradle launch party in the 200-year-old barn of the real-life Jenny, whose generosity and love for others inspired the character in the book. Merrill reads to Ezra, her youngest child. A former journalist, Merrill was a correspondent for The Boston Globe, wrote parenting essays for The New York Times, was a contributing editor to Down East magazine and co-wrote a history for Harvard University–all while raising six children. 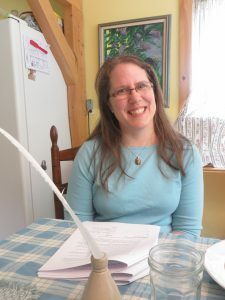 She currently writes for children and adults from a little house in the big woods of midcoast Maine, where she lives with her family, one pig, an all-kinds-of-cute rescue puppy and a flock of mischievous chickens.